With its distinctive silver-bullet shaped profile, the Airstream has been an integral part of the American recreational landscape for more than eighty-five years. Since the 1930s, thousands of Americans have used it as a personal canvas to paint their own unique story as they`ve traveled the road of life, and today, these stunning, nostalgia-laden vehicles are more popular than ever. 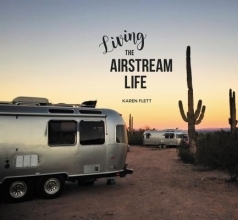 In Living the Airstream Life, Karen Flett tells the unique story of the designers who have transformed the brand into a mainstay of American life and the dreamers.